The three night-time German raids claimed some 400 civilian lives. (2) Churchill had been rumored to be staying at the Abbey Hotel in Bath, but the German bombs did not hit the hotel. 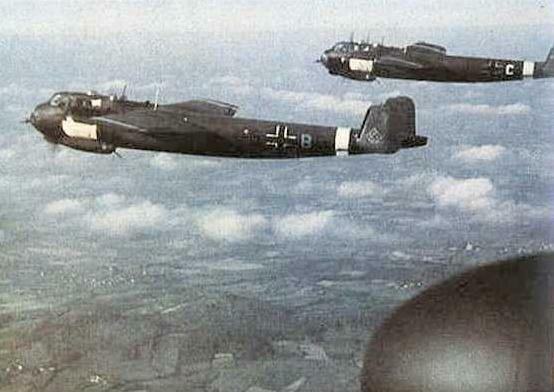 Herr Schludecker, who was twice awarded the Iron Cross, flew the Dornier 217E on 120 raids against targets in England between April and July 1942. The average life-expectancy then of a German pilot was seven raids. At the time Schludecker and the crews of the other 163 aircraft taking part in the raids upon Bath had no idea that they were exacting revenge for the bombing of the port city of Lübeck in northern Germany on the direct orders of Adolf Hitler. Lübeck had been attacked by 234 Wellingtons and Stirlings that dropped about 400,000 kgs of bombs including 25,000 incendiary devices during the night of March 28/29, 1942. German police reported 301 dead, 3 missing and 783 injured. More than 15,000 people lost their homes. (3) In 1942, Arthur "Bomber" Harris was appointed chief of English Bomber Command and chose Lübeck, an historic medieval city, to test the new Allied program of area or morale bombing. 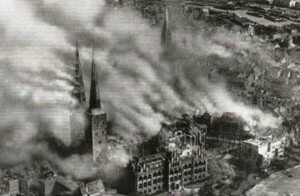 (4) Lübeck, having no military of economic importance, was selected because its timbered, medieval buildings made it a good target for incendiaries. The famed Marienkirche (St. Mary’s Church) was hit on the night March 28/29th. Civilized countries talk about human rights and then they bomb us. Give my message to the Pentagon: this is our village. This is our only place for living. We have just collected pieces of bodies, chunks of human flesh, and we have put them into the graves. It was not possible to identify them. Sixty-five bodies of civilians were taken out of the destroyed houses, seven remained under the rubble, and we received 10 persons who had died on the way. That made 82, the figure I originally reported in my data base (at http://pubpages.unh.edu/~mwherold). Richard Lloyd Parry mentioned 55 dead. Number of aircraft in raids 163 n.a. The graph below compares the deadliness for civilians in four bombing attacks: one by the German Luftwaffe, two by the British Royal Air Force, and one by the U.S. Air Force. Contrary to popular belief (amply nourished by so-called defense intellectuals and corporate media pundits, e.g., William Arkin of the Washington Post), precision bombs as I have tirelessly argued (12), do not spare civilian lives. So-called “precision” weapons have not made the slightest dent in the inexorable trend over the last century of greater numbers of civilian relative to military deaths. It is utterly inconceivable that U.S. pilots, who bomb/bombed Afghanistan – like the two below - causing thousands of civilian deaths there, would ever apologize to their victims. Have any of their fellows (like Senator John McCain) apologized for Iraq, Serbia (1999), Panama (1989), Colombia, El Salvador (1980’s), Laos, Cambodia, Vietnam? No, they come from the “chosen nation” clothed in self-righteous, imperial American exceptionalism (and Manifest Destiny). 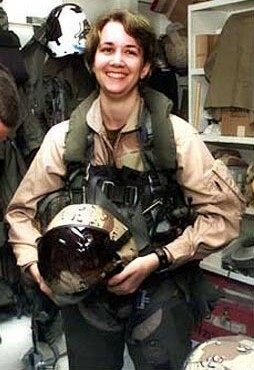 (14) The two pilots mentioned below typify American pilots bombing Afghanistan. 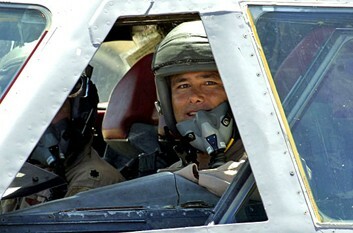 U.S. Air Force Lt. Col. Larry Littrell, pilots a B-52H and logged 5,000 hours in combat missions over Afghanistan, dropping thousands of bombs. Littrell says the close air support his massive bomber provides to US (occupation) forces on the ground “should give them a piece of mind that America hasn’t forgotten them, and nothing shows resolve better than a 2,000-pound JDAM bomb.” U.S. Navy pilot, Lt. Ashley, who participated in the early bombing of Afghanistan in an F-14 Tomcat, fondly remembers, “I was smiling: I had dropped my bombs. They hit.” In mid-October 2001, an officer on board the US aircraft carrier, Carl Vinson, described the use of bombs dropped by American B-52H bombers based on the "British" Indian Ocean territory of Diego Garcia. "A 2,000 lb bomb," he said, "no matter where you drop it, is a significant emotional event for anyone within a square mile." (15) “Wall Street”, another B-52 pilot, who flew 19 missions over Afghanistan put it slightly differently, “when they gave us the coordinates, we’d kill whatever they told us to.” (16) Remorse? American exceptionalism has justified armed aggression from Theodore Roosevelt’s ‘Big Stick’ Pax Americana to Clinton-Bush Humanitarian Imperialism. (17) It also allows the United States to disregard international law. (18) The mantra is Support Our Troops and God Bless America. 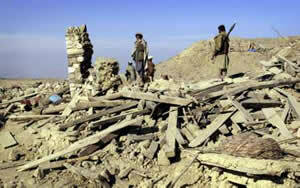 12- As in Marc W. Herold, “ ‘Collateral Damage’? Civilians and the U.S. Air War in Afghanistan,” in Aftab Ahmad Malik (ed), Shattered Illusions Analyzing the War on Terrorism (Bristol, England: The Amal Press, 2002): 209-246. 17- An excellent analysis of the latter is Jean Bricmont (translated by Diana Johnstone), Humanitariuan Imperialism. Using Human Rights to Sell War (New York: Monthly Review Press, 2007), 176 pp. 18- Nils Andersson, Daniel Iagolnitzer and Diana G. Collier (eds), International Justice and Impunity The Case of the United States (Atlanta: Clarity Press, 2008), 304 pp. The percentage of Afghans who say they feel safe walking alone at night in the city or where they live also dipped significantly since the previous year, down to 29 percent from 37 percent in 2010.